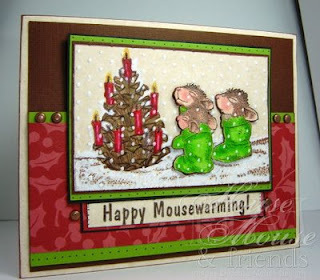 The image is from Stampabilities, House Mouse Designs called: "Peaceful Candlelight", # HMJR1050 . I cuttlebugged the entire colored image in the CB DOTS folder. Then added an extra layer of just the mice (for dimension), and drew in polka dot snow throughout the entire panel with the SU white signo gel pen. Also added a few dots around the edges. So darn adorable! Okay I just love the vibrant green for the stockings, its awesome. Your snow is perfect! America this is just wonderful! Great card an such a lovely image! Wow what a brilliant idea - Love this it's adorable! Sooooo cute!! I love how you used the swiss dots to create the snow!! OMG! This is the cutest card. I love your style, colors, and just everything on this card. Very cool card America! (why do I always picture you as "Betty"? :) Can I have your autograph? So so sweet, awesome job. This is darling! What a lovely card and all of your details are perfectly delightful! So very cute!! The stockings are awesome! Love your card! It's gorgeous! Those dots are brilliant.